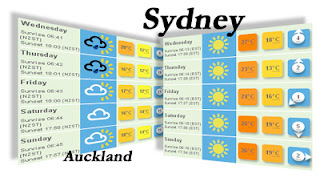 After taking a look at the weather forecast for Sydney yesterday, and comparing it with Auckland, you gotta realise that the weather plays a massive part in HOW we respectively live. Kiwi's in April are donning skivvies and turtlenecks, while Australians are still skipping to the beach in a skirt. If it's sunny in Auckland, for example, it might be too windy to eat on the deck at a cafe, so we tend to stay indoors (or at work). Sydneysiders might catch the bus to Bondi, and perhaps taking a 20 minute dip in the water before changing and organising a business meeting on the bus trip back. In Auckland, in April, on a "good day" like today, at best we might head to a neighbours place, or friends or family for a spring BBQ with wine, in a last ditch effort to claim something of the tailwinds of summer. In Sydney, in April, every day is a good day. You'll visit every relative over the month, eat fabulous food and drink a plentiful amount of good wines. You could easily visit Manly a few times by ferry as well, even scoring a tan!! 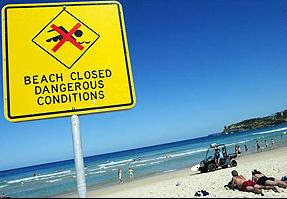 <-- oh yeah, this sign was put up to warn Australians of a possible Tsunami affecting the area... whoops!